Some foods have a distinct seasonal disposition. Ice cream for summertime, apple pie in the autumn, hot soup during winter, and roasted artichoke in the spring. Well, I have a feeling that this soup surpasses seasons. It’s both light and hearty and is just as delicious chilled as it is warm. I often daydream about food and make up different recipes while doing things unrelated to cooking. Well recently, in the middle of a daydream, I got an idea for making a soup that would have nut milk for its base. I imagined a bowl full of soup that is “blond” and creamy, and became excited about the possibilities of the milk’s earthy flavour. It took quite a bit of experimentation until I was able to minimize the ingredients to two simple companions to almond milk – apple and fennel. Combined with the milk’s nutty taste, the two bring a sweet and fresh presence to the bowl. The spice of chili and coriander deepens the flavour and ties the whole thing together with a slight kick. The use of nut milk instead of whole nuts makes for a much lighter soup. Pumpkinseed cheese is a fairly recent discovery. The first time I made it, I could not believe what a wonderful result I got with so few ingredients. It’s a bit like a cracker. A cheesy, healthy, and delicious one. I’ve made it very frequently over the past couple of months. It’s simple, and works as a wonderful snack or part of a meal. I like to serve the soup with this “cheese,” but it’s very possible to pair it with any crackers of your choice. In a high speed blender, thoroughly combine all the ingredients. Strain through a nut bag or double lined cheesecloth, carefully squeezing all the liquid out. Use 2 cups of the milk for soup, and if you have some left over, enjoy it with your breakfast or cookies. You can make these cookies out of the left-over almond pulp. In a high speed blender, combine all the ingredients until smooth. Adjust the salt and spices. Garnish with the cubed apple, pumpkin seeds, and a drizzle of chili olive oil. Before serving, heat up in the dehydrator or serve chilled. In a food processor, blend all the ingredients until smooth. Thinly spread onto Teflex sheets and dehydrate at 115F for 6 hours. Flip and remove the Teflex. Break into pieces and dehydrate for another 2 hours. Sounds like you have a soup for each season, and then some. 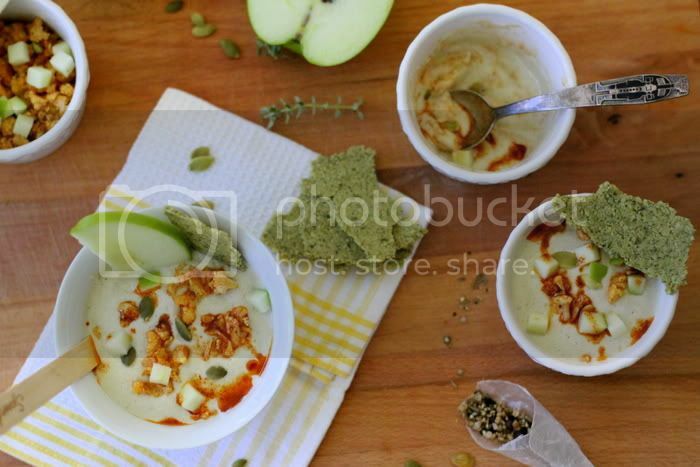 Great flavor combos and the nut milk… you can just about taste it from your pix and descriptions. Can’t wait to see your fall and holiday creations! 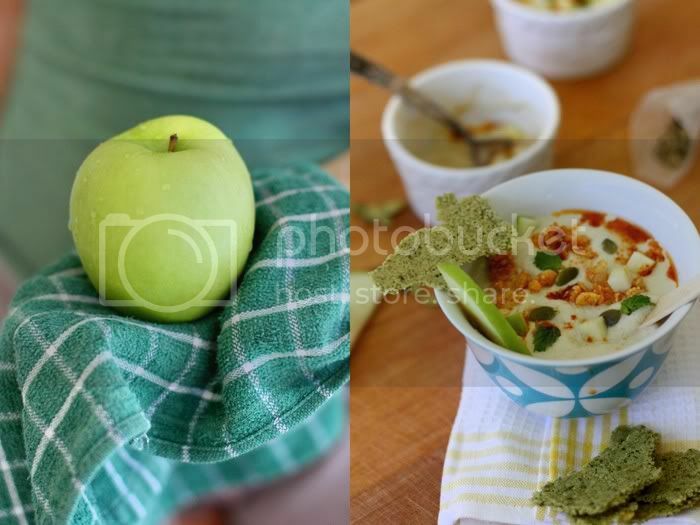 Again a very original recipe and beautiful pics (I’m starting to repaet myself…). I love the idea of a fresh fennel soup. Thank you! The pictures are beautiful! I’ll have to try the soup this weekend! Thank you for sharing. 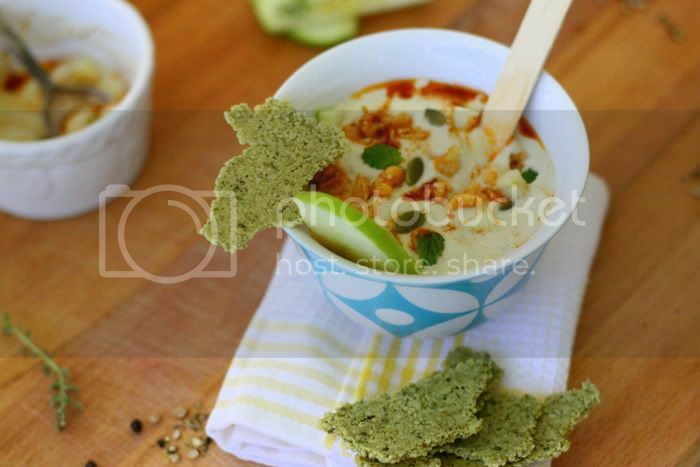 Very original and beautiful soup… I love the hint of spice! Oh, this sound so delish! I’m really curious to try the pumpkin seed cheese. You are a culinary genius, Anya!!! This, too, is another scrumptious looking creation!!!! What a unique recipe!! I would have never thought to incorporate nut milk into soup….I have some fennel left over from our CSA box so I will definitely have to try this out this week. thank you! Sean: I definitely have a favourite soup to cook for all four seasons :) Working on holiday right now! Thanks for your comment! AlaskaSmiles: Thank you, hope you enjoy it. Jacqui: I can’t say enough about the pumpkinseed cheese. It’s so simple but turns out so tasty! Sue: Thanks for your alway-sweet comments! I second what Kasi said!! YOU are a culinary genius!! 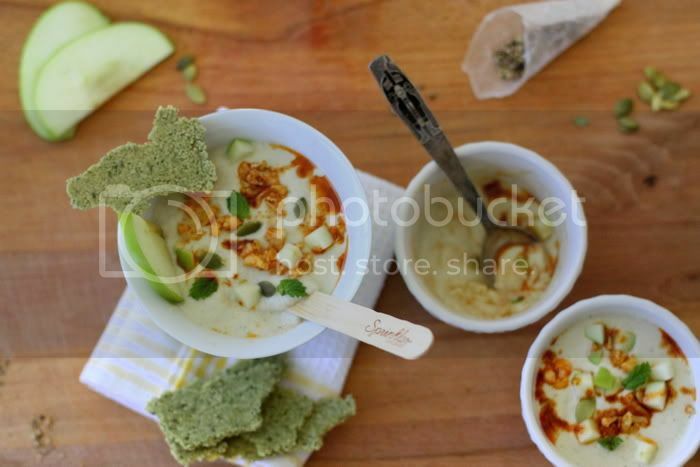 A creamy apple soup, Yum!! What a delicious creation, also I think your recipe for pumpkinseed cheese will soon become a firm favourite here too!! Oh, and, your blog is just beautiful!! Kasi and Karen, thanks so much for your support! We always love hearing from you! Sn, the recipe makes about 3 cups, which is about 4 portions, depending on the portion size. Hope this helps! I made this over the weekend and wow, it is so good! I did it with pear instead of apple. You are so talented! So, I just made the soup with a few alternatives. Instead of almond milk I used pumpkin seed milk, and I used half a cup less because I didn’t make enough beforehand. I also used red chili pepper flakes instead of a chili. This is so good. My goodness! I think I have a new favorite raw food recipe. I have a problem with a lot of raw food recipes in general because they either don’t taste good (maybe I’m too fickle) or they are way too complicated and expensive and time consuming. I’ve made a few of your other recipes and everything I’ve made that you have posted has been really good! Thank you so much for this beautiful blog, I check it all the time. Also, I’m dehydrating the pumpkin seed cheese right now, it tastes great right now, can’t wait till it’s dry.